1st time depositors only. Min Deposit £10.Max Games bonus £500. To withdraw games bonus & related wins, wager x40 the amount of your Deposit + Bonus funds. Bonus Spins are valid on specific games, for 7 days. Bonus Spins wins are granted in games bonus after all Bonus Spins are used. 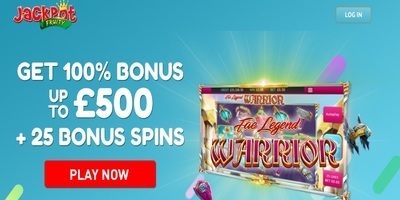 Bonus Spins wins are capped at a max Win of £10. Games Bonus wins cap: £400 + the initial bonus amount. Withdrawal restrictions & T's & C's apply.